One of the classic excuses that teachers all over the world have heard would be this, “My dog ate my homework.” It is still interesting to know how this excuse got started, and how children still believe that it might work. 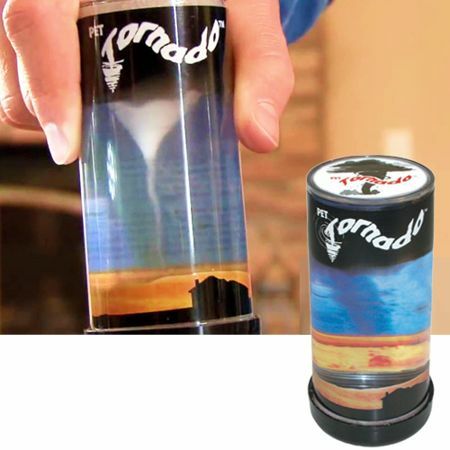 How about bending the truth a little bit with something more fun – to the tune of the $7.99 Pet Tornado, to be exact? You can say that a tornado swept through your home, and took your homework along with it, although the teacher might raise an eyebrow and wonder how come there was no such report on the news regarding a local tornado. Still, with the Pet Tornado, all that you need to do is to give it a swirl or shake it clockwise, and you would end up with your very on funnel cloud of spinning bubbles and sparkly glitter.